In 2006, the Niles Comprehensive Plan Committee (CPC), a volunteer group comprised of residents, business owners and other interested citizens was assembled and charged with the development of a Town-wide comprehensive plan. The purpose of a Comprehensive Plan is to help guide future growth and development, while protecting the quality of life community values and of residents of Niles. A Comprehensive Plan is a public, consensus-driven document to be used by elected officials as a guide for decision-making within the Town. The plan not only includes information on the history of Niles, and the changes that have already taken place, but also focuses on how the community envisions the Town’s future, with goals and specific recommendations in support of the community’s vision. In order to create the comprehensive plan, a series of public meetings was held to identify community assets, areas in need of improvement, strategies for economic growth, and appropriate development within the Town. The Central New York Regional Planning and Development Board (CNYRPDB) served as a consultant to the CPC. The CNYRPDB is a public agency that was established in 1966 to provide a range of services in the areas of economic development, environmental management, Community Development, and regional information and research, to Cayuga, Cortland, Madison, Onondaga, and Oswego Counties. Since 2002, funding for the CNYRPDB’s Finger Lakes Water Resources, Agriculture and Open Lands Conservation Project secured by Congressman James Walsh has funded planning efforts in the Finger Lakes Region. 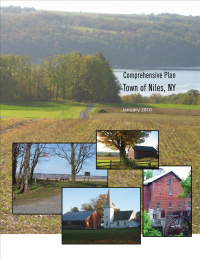 With the goal of assisting municipalities to protect water resources and open lands, preserve fertile agricultural soils, and maintain the traditional, rural character of the Finger Lakes Region and plan for compatible growth and development, the CNYRPDB’s assistance to the Town of Niles was paid for under this grant. Comprehensive Plan Committee working meetings were held monthly from August 2006 through May 2009, with four special topic visioning sessions held during the spring and summer of 2007. For further information, please contact Jeanie Gleisner at (315) 422-8276 ext. 212 or jgleisner@cnyrpdb.org. Low-resolution This file is 4.77 MB. High-resolution This file is 13.48 MB. For additional information on the Town of Niles Comprehensive Plan Project process, contact Jeanie Gleisner at jgleisner@cnyrpdb.org or (315) 422-8276, ext. 212.